Why is fencing such a great investment for your home? Learn here! What’s the first thing you notice about a house when you look at it? If you’re looking closely, you’ll notice that it’s the fence that brings the whole property together, literally! It’s like taking the beautiful picture that is your home and putting into a really nice frame. Besides enhancing the beauty of your home, here are just a few of the other reasons to make an investment in your own “really nice frame”. There are many plants that are harmed by too much sunlight. Fencing can help diffuse some of that sunlight and make your plants thrive. You could also invest in a custom wooden fence that would provide you some privacy and shade your outdoor furniture from sun damage. A chain link fence is usually the best bet to keep your dog safe. It isn’t usually the most aesthetically pleasing, but it is a great investment in assuring your furry friend can’t escape and be hurt or lost. And the dog will like that they can still look out and see the world through the links in the fence. Anyone who has children or has spent any time with them knows you just can’t keep them indoors. Even on rainy days, they want to go out and play. 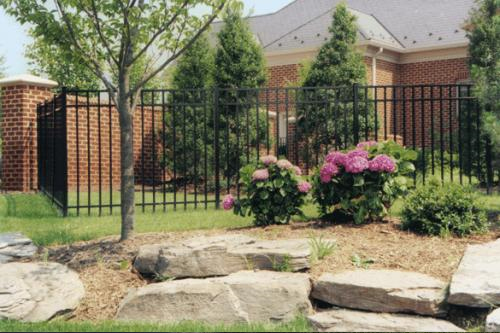 With the right fence, your kids will be able to safely have all the outside fun they want. An investment in vinyl fencing is a good idea for families because it lasts a long time with minimal maintenance, so you have more time to spend with the ones who matter most. This entry was posted on Friday, May 26th, 2017 at 7:50 pm. Both comments and pings are currently closed.